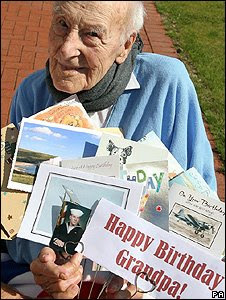 Henry Allingham, Britain's oldest man, has joked that his secret to longevity is "cigarettes, whisky and wild women". Born in Clapton, east London, in 1896, when Queen Victoria was on the throne, the 112-year-old's life has spanned six monarchs and 21 prime ministers. He has described the current Queen, who he has met on several occasions, as a "lovely lady", and said it was a "great honour" to meet her. Friends of Mr Allingham have described him as an "incredible man" who remains full of life. Dennis Goodwin, his friend and chaperone, said: "He is an example to us all. He keeps up with all the events and functions that he is invited to. "Last year we counted that he had clocked up 47 events which is quite something for a man his age. "He knows what's going on around him and enjoys the company of people." But the 112-year-old did not have the easiest start in life. His father died from tuberculosis in 1898, when Mr Allingham was 18 months old. When he was 19, his mother died. The teenager then enlisted with the Royal Naval Air Service (RNAS) as a skilled mechanic and a year later, in 1916, he was involved in the greatest naval battle of the World War I, the Battle of Jutland. A year before the end of the war, he was posted to France to support the Royal Flying Corps, and helped service and rescue aircraft which crashed behind the trenches. In 1919, after leaving the RNAS, Mr Allingham married 22-year-old Dorothy Cater in Chingford, Essex. The couple went on to have two daughters, and he now has five grandchildren and 12 great grandchildren. His wife died 38 years ago, while his daughters both died in their 80s. Following his armed forces career, Mr Allingham worked in engineering roles, and was in a senior position with car manufacturer Ford by the time of his retirement in 1960. In 2003, he received France's highest military honour, the Legion D'Honneur, at a ceremony at Eastbourne Town Hall. In 2004, at the age of 108, he laid a wreath and led the service in the Lord's Prayer at the 90th anniversary of the World War I at the Cenotaph. To mark Armistice Day in 2005, Mr Allingham travelled to St Omer, near Calais, France, to lay wreaths to fallen comrades. A year later, aged 110, as the oldest British World War I veteran, Mr Allingham met his German counterpart, Robert Meier, 109. The men greeted each other warmly and laid a wreath at the war memorial near Witten town hall. Mr Meier said it was "amazing" that both men were still alive and went on to say: "Why did we have to have a war?" In 2007, Mr Allingham marked his 111th birthday on board the Royal Navy's oldest warship, HMS Victory, at Portsmouth. A military flypast of aircraft from the Royal Navy's historic flight and the RAF marked the occasion. Eight of Mr Allingham's grandchildren and great grandchildren and their partners flew from their homes in the United States to join him for his 112th birthday. On reaching the grand age, Mr Allingham said he felt "on the crest of a wave". He said: "People ask me how I've done it, and I just say that I look forward to another tomorrow." There are videos of Mr. Allingham on the BBC page, if the page is still up, anyway. Mr. Allingham manages to stay positive and always look forward to the future while enjoying activities and people around him every day. Keeping engaged with life is important. 'Navy Centenarian Sailor', 103 year old, former enlisted Aviation Chief Radioman (ACRM, Combat Aircrewman), later wartime commissioned Chief Warrant Officer Julio 'Jay' Ereneta, U. S. Navy (Ret. ), thirty year career veteran of World War One and World War Two. First flew aircrewman in August 1922. Flew in air squadrons of the Navy's first aircraft carriers, USS LANGLEY (CV-1) and USS LEXINGTON (CV-2).